Over the course of this grant project, the Boston Public Library team has been lucky enough to visit some of the prettiest libraries that the state has to offer. From small, redbrick buildings to newly renovated structures, I would safely boast that Massachusetts has some of the prettiest libraries in the country. So when we pulled up to a storage facility in Mattapoisett, we were all a little unsure of what to expect. But if there’s anything I’ve learned from working at the BPL, it’s that you find the most interesting items in the oddest places. 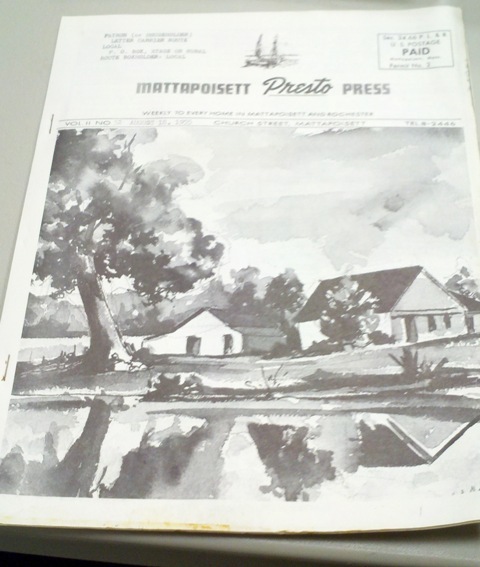 When we first entered the facility, we were taken to a private room where we could examine the collection proposed for digitization by the Mattapoisett Free Public Library. The boxes were pulled from a giant storage warehouse not unlike the one from Raiders of the Lost Ark. 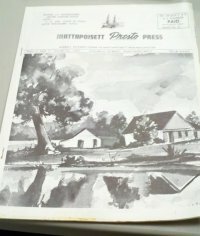 Contained within was the complete, half-century run of a local newspaper called The Presto Press, a magazine-format serial publication that included everything from want-ads to local historical and genealogical information. The first thing that strikes you about The Presto Press is the cover art. The publisher, Donald Jason, was a talented artist and illustrated a good majority of the covers himself. The real prize at the bottom of these serial boxes, however, is the advertisements. Normally, readers tend to skim over advertisements in any publication. When the publication is historic, however, the ads become a window into the miniscule, almost negligible parts of history that often get overlooked. For example, in The Presto Press, you could see ads for a number of items, services, and local businesses, including some that are still around today. The fact that you can discover the price of roast beef or milk ($0.75 per pound and $0.45 per gallon respectively) or how sewing machine companies tried to reach women of that era, is simply amazing. These are aspects of history that are largely ignored, but they play a role in how we understand our past. we can see how the country, its people, and the world has changed over time. 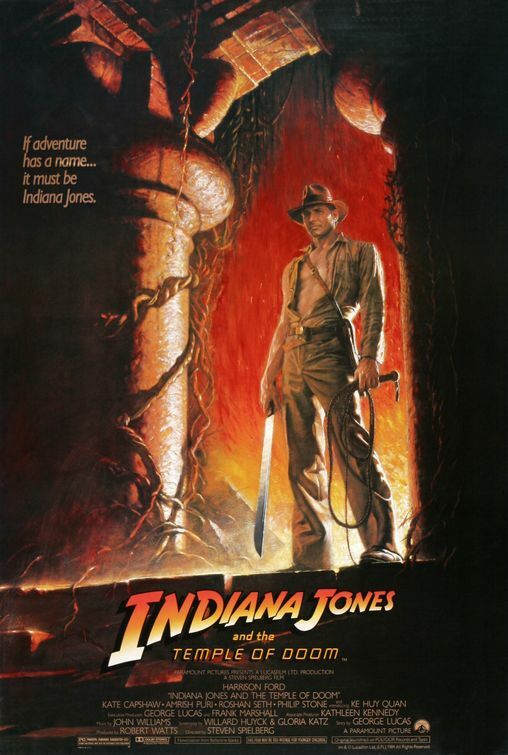 With or without the trademark fedora and whip, I think it’s undeniable that all librarians have a little bit of Indy in them. Even if they don’t escape from snake pits or hijack any German U-boats. 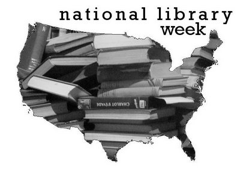 As many of you know, last week was National Library Week, a time meant to celebrate the contributions libraries and their workers make in their communities. So in honor of this recent celebration, I thought that I would take a moment to put the spotlight on the men and women that work behind the scenes at the BPL to make the statewide digitization project possible. And as for me? Well, I could tell you that I love my job and that every day working here is a new adventure and lament the fact that it’s impossible to choose just one memory, but in the end, one moment sticks out pretty clearly. I had just started here and I was looking for what I defined as ‘really cool stuff’ in the state of Massachusetts to digitize. I wanted to bring only the best and the ‘coolest stuff’ into our collection. One day, I happened to ask my boss if we had already digitized a particular collection of photographs, and he replied, “Probably, but that doesn’t mean we shouldn’t take the project.” At that point, I was a little confused. Wasn’t my job to find this ‘really cool stuff’, these one-of-a-kind, priceless, not-to-be-repeated materials that would make people go ‘oooh’ and ‘ahhhh’? As I learned that day, no, it was not. A small moment to be sure, but it radically changed the way I looked at my job and this grant project. I stopped looking for the really cool stuff and started looking for libraries that we could help, if only in some small way. And what I found out was that you find the absolute coolest stuff in the most random places. Like Bette Davis’s class yearbook, or handwritten 18th century intentions of marriage (found in a church basement), or even land settlements between the Pilgrims and Native Americans. These are the people who make it possible for said objects to be found, scanned, and delivered – casting these materials out of obscurity and thrown into the public eye once more. They devote their time and their talents because they believe that this project is important. So no matter what week it is, I think these people deserve not only respect, but acclamation as well. Happy belated National Library Week everyone! Given my relative youth, it’s a wonder that I would even think about writing a blog post about marriage. Luckily for me, I don’t want to talk about the institution of marriage as much as the significance of the historical process. 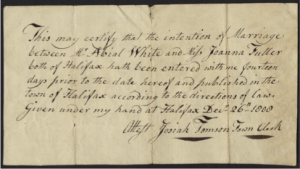 Recently, the Boston Public Library’s digitization team brought in a group of handwritten 18th and 19th century marriage intention certificates from the Holmes Public Library in Halifax, MA. 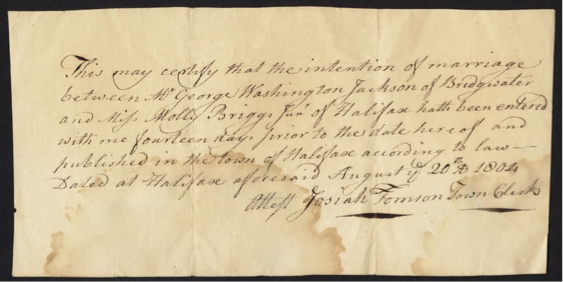 These documents are part of the town’s Congregational Church records. As I have always held some level of fascination concerning this particular period, these documents immediately piqued my interest. Historically, the requirement of an intention of marriage has been an incredibly restrictive one. During this time period, the act of marriage was not seen as a pact between two people as much as it was seen as the responsibility of the entire surrounding town. To ensure that the entire town or village approved of the match, the intention of marriage had to be filed. Typically, these forms would include names, counties of origin, the professions of the brides and grooms, the dates on which the forms were filed, and official signatures. This intention was then printed and distributed throughout the town as a flier that would be hung on post offices, schools, general stores, etc. 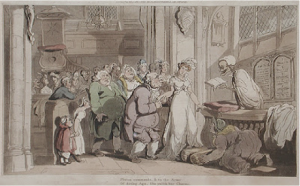 The marriage then had to be announced in church on three consecutive Sundays or Holy Days, which would give the townsfolk the opportunity to object to the marriage. This was referred to as ‘Crying the Banns,’ which still occurs for couples intending to marry within the Church of England. It ended many couples impending nuptials, especially in the case of a discrepancy in class or social standing. Laws such as The Marriage Act of 1753, made it almost impossible for couples to bridge the social gap between their two classes. As a result, many weddings blossomed not out of love and respect, but out of the security of knowing that your match would not be rejected. During this time period, many women lamented the matrimonial process, including such famous people as Mary Darby Robinson and Jane Austen. Robinson accounts her own doomed marriage in her posthumous memoir published in 1801. 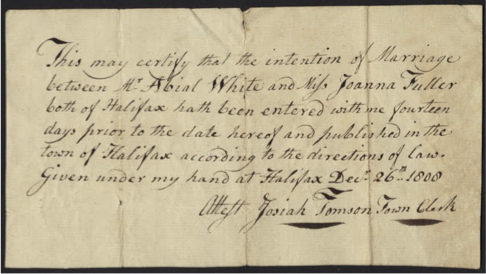 As I glanced through the Halifax records I couldn’t help but wonder how many of these women suffered the same fate as Mary Robinson? Did these people really love each other? Were these simply marriages of convenience? Did some of these couples even make it to the altar? “Every last one, route one, rural heart’s got a story to tell. Maybe knows it just a little too well. Hey, words gonna get around. One of the biggest surprises our team has encountered during this grant has been the overwhelming demand for the digitization of yearbooks. When we first began this project, we assumed that librarians would be clamoring to give us the rare manuscripts and antique printed treasures that researchers flock from miles away to see. But instead, we asked librarians to start with what their patrons use the most. The answer was overwhelmingly clear: it seemed yearbooks were the new ‘it girl’ of digitization. So when our team traveled to the Newton Free Library, we weren’t surprised to find that an almost century-long run of the Newton Public High School yearbooks was at the top of this library’s digitization ‘to do’ list. I think the reason that people are naturally drawn to yearbooks has something to do with their intensely personal nature. It’s not only a snapshot in history, but a snapshot of who you used to be and how you’ve changed (or haven’t changed in some cases). And I think that desire for progress is what keeps library patrons coming back to their old high school yearbooks. It’s a direct measurement of personal growth through the lens of your former self. In fact, when I was younger I used to write letters to my future self in the back pages of my yearbooks. I would tell myself things like, ‘I hope by now we’re a famous writer and we travel to all kinds of different fascinating places with our husband, Michael Vartan (give me a break, I was 11. At least I got the first half of it right. I am a writer of sorts and I do get to travel to all sorts of interesting places for my job. I just don’t happen to be married to the star of Alias). But I digress. 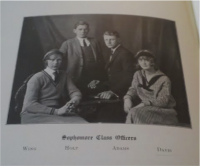 These particular yearbooks held an exceptionally fascinating entry. 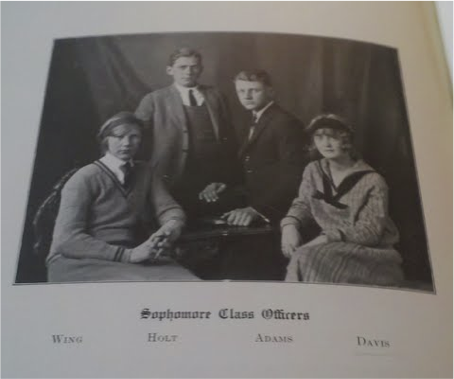 On first glance, it’s simply a picture of Student Council officers, but if you look at the first name from the right, you can make out the name ‘Davis’. As in Bette Davis, the recipient of 10 Academy Awards for her work in movies such as Jezebel, The Little Foxes, All About Eve and What Ever Happened to Baby Jane? But before all that, she was just plain old Ruth Elizabeth Davis from Lowell, Mass. During her 60 year acting career, Bette Davis knew the kind of fame reserved for the absolute highest of the A-List celebrities and in 1999, the American Film Institute named her as the second greatest female star of all time (the number one slot went to Katherine Hepburn). But the thing about yearbooks is that regardless of how far you go in life or what you do or don’t accomplish, everyone captures fame for at least one moment, and it’s recorded in these pages. Like the song says “everyone dies famous in a small town.” Newton, MA might not be the smallest town in the world, but I think the concept still applies. That desire to feel like you were a part of something great applies not only to famous movie stars, but also to the clerk at your local supermarket. 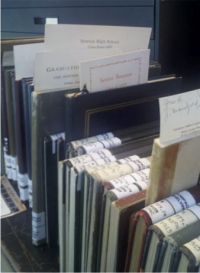 To read more about our efforts to digitize yearbooks, check out this Boston Globe article. February has traditionally gotten kind of a bad wrap. Its name in Old English was Solmonath, or “Mud Month” and during the reign of Charlemagne it was referred to as Hornung, meaning “the shedding of antlers”. I prefer to think of it as the Finns do. They call February helmikuu, which means “the month of the pearl”. 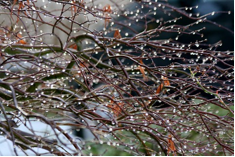 The Finns gave February this name because they associated it with the droplets of snow that began to melt off the trees as the landscape prepared itself for spring. Here at the BPL, we’ve been doing a lot of helmikuu-type work, mainly focusing on fostering new relationships with libraries throughout Massachusetts. So it seems only appropriate that on the first day of this month of preparation and transition, we set off to meet with the staff at the Gleason Public Library in Carlisle, Mass. for the first time. The building’s history dates back to 1896, but the records we were there to pick up went back even further. 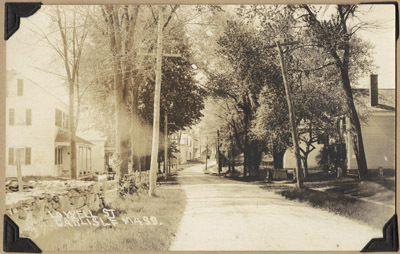 The library is home to volumes of local history and genealogical information that read much like a family scrapbook. There were articles, documents, pictures, and notes, all meticulously handwritten, collected, and preserved in carefully organized notebooks. Although our trip was brief, it was incredibly productive. We met with the library staff, answered a lot of questions about the process, took inventory of the volumes and got a tour of the library. We even got to see some antique dental equipment currently on exhibit. And as we were setting our GPS device for home, a true Kodak moment occurred. Happy Helmikuu everyone! I hope you find your pearls. Some time in between Goodnight Moon and The Origin of Consciousness in the Breakdown of the Bicameral Mind, I became absolutely fascinated with beginnings. And with stories, as with the digitization of rare materials, one always finds that the beginning is “the most important part of the work” (Plato, The Republic). “Where do you even start?” a librarian once exclaimed to me. Well, the answer for me was Cape Cod Community College (CCCC). It seems somewhat fitting that one of the mantras of this particular school happened to be “for you, for now, forever, there’s no better place to begin.” It was certainly true for me. It was my first day at the Boston Public Library and I found myself in the back of a Zip Car full of librarians headed to Cape Cod. 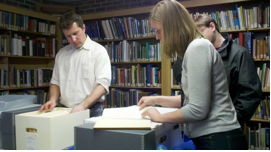 A very generous LSTA grant is what brought us there, allowing BPL staff (and affiliates) to travel around Massachusetts collecting materials for digitization. But it was also more than that. 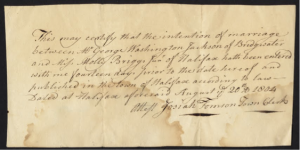 A passion for preserving history combined with the promise of authentic, handwritten deeds dating back to the founding of Massachusetts can make a librarian trek just about anywhere. When we arrived at the loading dock, we were greeted by Mary Sicchio, the Special Collections librarian at CCCC. After unloading and returning some already digitized materials, Ms. Sicchio took us to the Historical Collection Room, where we got the chance to examine the documents at length. And I must say, for their age, these documents were in great shape. The paper was in good shape, the ink was readable and the penmanship was gorgeous.There’s something so fascinating about older manuscripts. They jump off the page at you. The handwriting is so distinct that the document just kind of exudes personality. And that’s why I think the work we’re doing is so important. Books, manuscripts, historical documents, these are all living things (not in the sense that we are alive, but in their own, more symbolic way). They have their own personal flavor and without a program like this one, I fear that the life will slowly drain out of the written word. One of the most distinct features of this collection was the way it was cataloged. Each library has their own system of organization when rare collections are concerned, but this one was particularly unique. So after cracking the code of group and item level data annotations, we decided to check in on the technological side of things. Chrissy Rissmeyer, our Metadata Coordinator, went over the process for creating solid information architecture to support their records. After discussing what kind of online cataloging worked best for them and walking the CCCC team through the next few steps of the process, we packed up our Zip Car with as many deeds and handwritten historical documents as we could carry and headed for home. Overall, not a bad first day. Cape Cod Community College was right. For me, for now, forever, there was no better place to start. While the Digital Commonwealth website is under reconstruction and reconfiguration, some of the content discussed above can be seen at: http://www.archive.org/details/capecodcommunitycollege. This content will also be linked from the soon-to-be-released CCCC online finding aid database, powered by the open source Archon platform. The People of Massachusetts Will Have a Digital Library. For the past several years, the BPL has been digitizing books, photos, maps, manuscripts, prints, and other library materials so that they may be accessible online. This work is done at two state-of-the-art digitization labs in our Central branch in Copley Square. Our digitized collections can be found under the “online collections” tab of our home page. Nearly 100,000 items can be explored and downloaded across a variety of websites. More recently, we have begun digitizing materials from other libraries, archives, museums, and historical societies from across the state. This work is being funded by a federal grant awarded to us by the Massachusetts Board of Library Commissioners. The goal of this project is to grow and support Digital Commonwealth, a consolidated statewide digital library system. Organizations with collections they would like to have digitized can apply for this service online. Already, more than 50 different organizations have asked to become partners with us so that they may contribute resources to our state’s digital library system. This is just one example of how we are using technology to make library resources accessible to as many people as possible throughout the city, the state, and beyond. 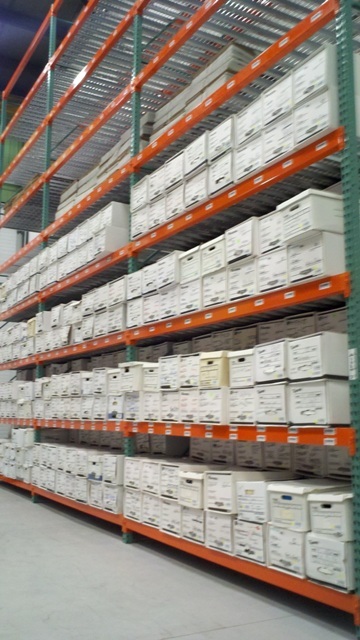 As part of this effort, the BPL Digital Services team has been traveling to many of our partner institutions to evaluate the items selected for digitization and to offer advice on how to best prepare these materials so that they may be seamlessly uploaded into the Digital Commonwealth system. Emerson College intern, Christina Manzo, has been accompanying us on many of these site visits. In addition to serving as a project liaison and conducting outreach to prospective applicants, Christina will be offering her perspective of the project in a series of blog posts to be featured here on our Compass Blog under the tags “Access and Innovation” and “Center of Knowledge” (principles IV and VI, respectively). Majoring in Communications and Dramaturgy, Christina is an avid and experienced library user and plans to pursue an advanced degree in Library and Information Science soon after she finishes her undergraduate coursework. We hope you enjoy her observations as we strive to extend and connect resources to libraries and library users across the Commonwealth. If there is a library, archives, museum, or historical society in your community that you would like to see involved with this project, please let us know by sending a message to digital@bpl.org! Welcome to the new site for the Digital Commonwealth / Boston Public Library Digitization Project. Things have been going gangbusters, and we wanted to show you all the awesomeness we’ve found.